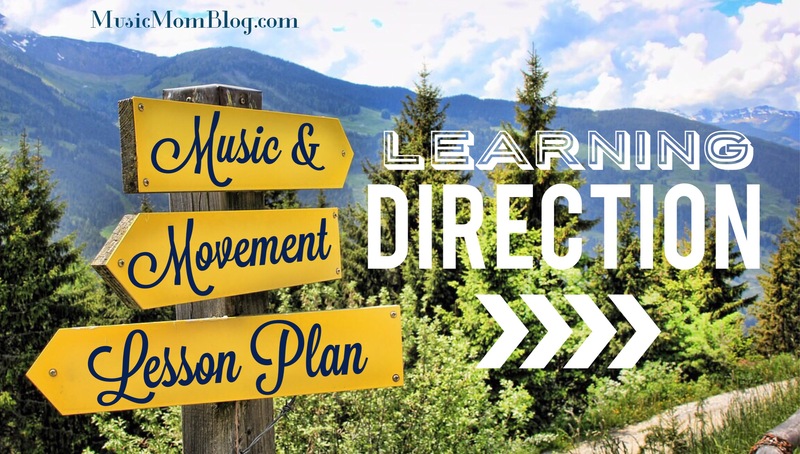 This week’s music and movement lesson is on learning Direction. As in – up, down, behind, left, right, in front of, etc.. Here’s a great topic to reinforce using music to help our kids understand us exasperated parents when we try to direct them to find their other shoe, sock or toy. Yes folks… this topic of Direction deserved it’s very own theme of the week! I can just imagine all the parents applauding the choice of theme, perhaps even shedding a tear of joy. Also bring a portable instrument or even a few (if you have) for the Musical Principle Activity. This could be a recorder, mouth organ, ukulele or guitar. As always, listen to and learn the songs prior to the class so that you know how the songs go. You may use other Direction songs if you prefer to use other songs of your choice. Bring along small percussion instruments for the children to use, such as small drums, maracas or bells for the Instrumental Activity. Gather the children together in a circle and greet one another with the Hello Song/Warm-up Song you prefer to use. Introduce the Direction theme using the big arrow picture you made. Ask the children what arrows are used for and what they tell us. Do some activity examples using the arrow for the children to see – wave your hands up; shake your hands down; hide your hands away; move them to the left or right; spin around; and fold your arms in front of you. Now use the song “Here We Go” by Jack Hartmann. I enjoyed using this song because it is upbeat and cool. Ask the children to all carefully follow the direction you move as you dance to the song. This is a fun song that teaches up and down, as well as counting. Use the cues from the song to act out the different animals. The song ends in everyone crashing to the floor because the elephant sat on the clock! Use the portable instrument(s) that you brought to demonstrate high and low pitch. Explain what pitch is: How high or low the note that is being played sounds. Now it’s time to play the Pitch Perfect Game: When you play a high pitch, the children raise their hands in the air. When you play a low pitch, the children must touch the floor. It’s a cute activity that the children enjoy as they hear different pitches. This activity is important in developing the children’s ear for different pitches. Play instruments to the song “Upside Down” by Jack Johnson. Make sure the children are able to learn how to play on the beat. Count 1-2-3-4 aloud as you play along with the song. You can decide if the children should sit or stand for this activity. Mix up things with doing different actions while playing the instruments, like playing above your head, behind your back, turning around, playing fast or slowly, etc. Be creative with using all the directional terms the children will understand. Here’s another song that teaches up and down, as you use your one little finger to point. Use the cues from the song to point to each different part of the body: head, nose, chin, arm, leg and foot. This song ends with “Goodbye” which makes it a very suitable concluding song. Sing your Goodbye/Winding-down song in your circle.